Today weather forecasting is regarded as an integral aspect of news reporting but in the mid-nineteenth century that concept was in its infancy. 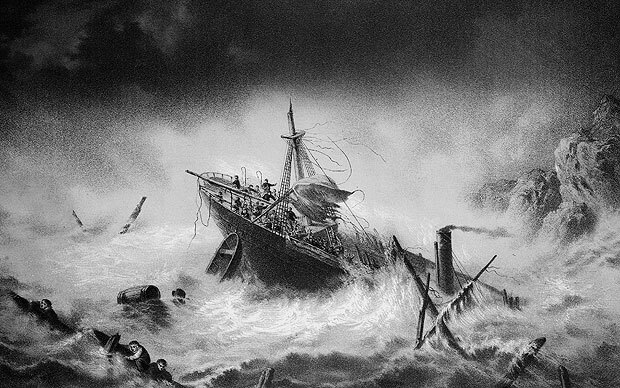 It took the massive “Royal Charter Storm” of 1869 to emphasise the necessity of such a system and the credit for conceiving the idea was due to Captain Robert Fitzroy (1805-1865). Fitzroy – a tragic figure, as we will see later – had been captain of the Royal Navy’s HMS Beagle on her voyages of scientific discovery with Charles Darwin in the 1830s. Fitzroy had later been Governor of New Zealand from 1842-45, a difficult appointment at a time when white settlers and Maori communities were coming into conflict over land ownership. 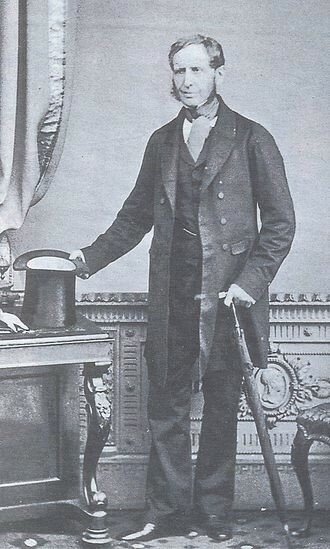 Fitzroy’s subsequent naval career was ended by ill health and in 1854 he was appointed to head a new government department to deal with the collection of weather data at sea. As such it was to be the forerunner of the modern Meteorological Office. 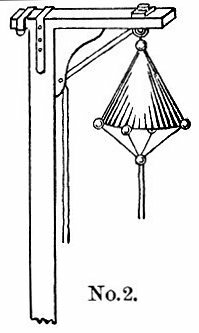 With a staff of three Fitzroy set up a system whereby calibrated instruments were loaned to ships’ captains for record-gathering and subsequent collation of the resulting information. He soon recognised that availability of weather information to shipping and fishing interests could avert tragedies. The first measure he implemented was provision of standardised barometers which were installed in stone housings at ports so that crews could consult them before setting out to sea. The next logical step was to make information available on a national rather than a local basis, a concept which Fitzroy named “forecasting the weather”, the origin of the modern term “weather forecast”. The first daily weather forecasts were published in The Times in 1861. 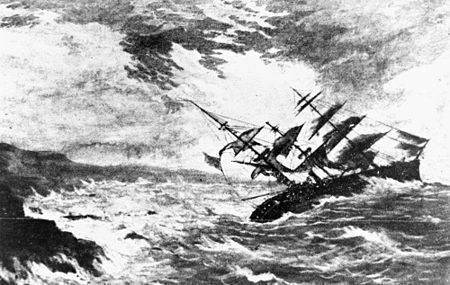 The availability of telegraphic communication was a major facilitator but the trigger for more comprehensive action was to be a tragic one, the storm in 1859 which became known as “The Royal Charter Storm” after its largest victim – one, regrettably, of some 130 vessels sunk and 90 damaged. 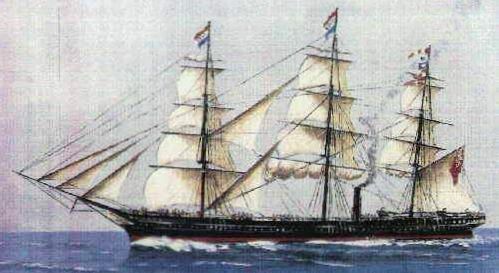 The SS Royal Charter was a modern vessel, a 2720-ton, 236-foot steam clipper built in 1855 for passenger service between Britain and Australia. She had accommodation for 600 passengers; some in luxury, and was fast in her day, capable of making the voyage in under 60 days. On 25th October 1859 she was in the Irish Sea, on the last stages of a voyage from Melbourne, Australia, to Liverpool. She carried a crew of 112 and 371 passengers, many of the gold-miners who had been successful in the Australian diggings and who were carrying large sums of gold about their persons. More gold was also being carried as cargo. As the Royal Charter reached the north-western tip of Anglesey on 25th October – and was about to turn eastwards towards Liverpool, the barometer was already dropping. This was the first indication of a storm of huge geographical extent. Weather had already deteriorated in the English Channel earlier in the day and significant damage had already been sustained in Devon and Cornwall. In the hours that followed the storm moved northwards, hitting the area where the Royal Charter found herself by 2000 hrs. This was only the start of the tempest – maximum force was not recorded until midday on October 26th and the storm rolled northwards towards Scotland with winds at their peak reaching force 12 on the Beaufort scale and well over 100 mph. The Royal Charter was due to pick up the Liverpool pilot off Anglesey on October 25th but with the wind by then at 10 on the Beaufort scale this was impossible. The wind continued to rise to hurricane force during the night of 25/26th October, changing its direction as it did from East to North North East, so driving the Royal Charter towards the north-east coast of Anglesey. Unable to make way – her installed horsepower was only 200 – the decision was taken to drop anchor. The mooring held initially but first one anchor chain, then the second, snapped in the early hours of 26th October. Now helpless, the ship was driven first on to a sandbank and then, as the tide lifted her, she was thrown on to rocks just north of the village of Moelfre on Anglesey’s east coast. Pounded by the waves, the Royal Charter now began to break up. This description has much in common with the description of the storm at Yarmouth in which Ham Pegotty dies while trying to rescue the worthless Steerforth in David Copperfield (1850) – one wonders how closely Dickens based Life upon Art when reporting the Royal Charter disaster. Rescue by boat proving hopeless, it was resolved to get a line ashore from the ship, which could then be used to get survivors to safety with a bosun’s chair. 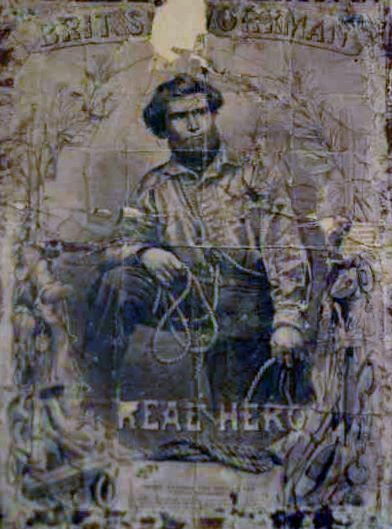 Getting a line through the boiling surf demanded a hero and one stepped forward in the shape of a Maltese seaman, Guże Ruggier, who served under the anglicised name of Joe Rodgers. He was a strong swimmer but in the surf his progress would be impeded by a rope. He declined using a life belt and secured a line about himself, crawling out along the bowsprit before dropping into the water, disappearing into the foam and darkness. Though he could be no longer seen those on board felt the rope gradually hauled out. At length they felt it tauten, confirming that it had been grasped by those on shore. A stout rope was now fastened to the line. It was dragged to shore and a bosun’s chair was attached to it. All this time the Royal Charter was beating herself to wreckage on the rocks. The slow process of transport by bosun’s chair now commenced, one after the other, with 28 villagers hauling from shore. Twenty five persons were brought on shore in this way before the ship disintegrated, taking over 450 victims with her. Many of them were said to have been weighed down by the belts of gold they were wearing. A total of 21 passengers and 18 crew members were saved, all men, and no women or children. In the light of this, the recognition of Joe Rodgers’ courage seems miserly – he was given a gold medal and a gratuity of £5 ($20 at the time) by the National Lifeboat . 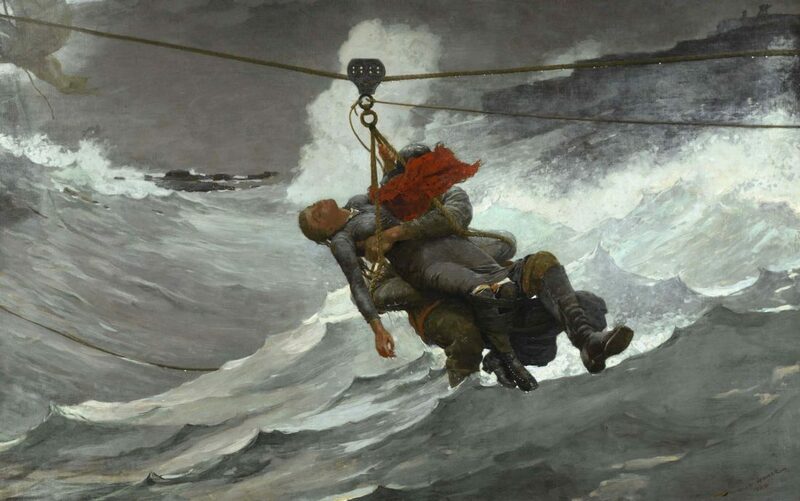 Dickens’s friend, the painter Henry O’Neil, exhibited the picture “A Volunteer” in 1860, depicting Rogers about to leap into the sea with the rope around him. Though the largest victim of what came to be known of the “Royal Charter Storm”, this vessel was not the only one. The hurricane sank a total of 133 ships and damaged another 90 badly while onshore falling rocks and masonry also killed. The final death-toll was estimated at around 800. The number of lives last at sea off Britain in these two days was double that of the entire previous year. 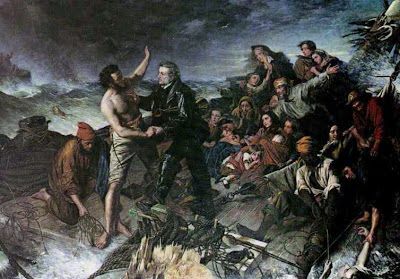 The Royal Charter Storm and its attendant tragedies did however impel Captain Fitzroy to introduce the first gale-warning service in 1860. This was a system of hoisting “storm warning cones” at the principal ports when a gale was expected and shipping was recommended to stay in port under these conditions. It is a sad reflection of the profit-orientation of contemporary fishing fleet owners, even at the expense of life, that many objected to the posting of gale warnings. Under pressure from them Fitzroy’s system was briefly abandoned after his death, though finally reinstated under pressure from fishermen themselves. Largely remembered today only as the captain of HMS Beagle, Fitzroy was in fact one of the great Victorian heroes, and one to whom thousands would owe their lives. His own end was tragic. Beset by money problems and, as a sincere Evangelical Christian, disturbed by to the point of obsession by his erstwhile friend Charles Darwin’s “Origin of Species” and by what he saw as its challenge to Biblical literalism, he cut his throat with a razor in 1865. This noble man, who achieved so much for so many, deserves to be well remembered.